The effects of the azoles on fungal biochemistry have been studied extensively, but there is still much to be learned.45 At high in vitro concentrations (micromolar), the azoles are fungicidal; at low in vitro concentrations (nanomolar), they are fungistatic. The fungicidal effect is clearly associated with damage to the cell membrane, with the loss of essential cellular components such as potassium ions and amino acids. The fungistatic effect of the azoles at low concentration has been associated with inhibition of membrane-bound enzymes. A cytochrome P450-class enzyme, lanosterol 14a-demethylase, is the likely target for the azoles.46 P450 possesses a heme moiety as part of its structure (Fig. 6.5), and the basic electron pairs of the azole rings can occupy a binding site on P450, preventing the enzyme from turning over. The function of lanosterol 14a-demethylase is to oxidatively remove a methyl group from lanosterol during ergosterol biosynthesis. Figure 6.5 • The inhibitory action of azole antifungal agents on the lanosterol 14-a-demethylase reaction. When demethylation is inhibited, the 14a-sterol accumulates in the membrane, causing destabilization. As this happens, repair mechanisms, such as chitin synthesis, are initiated to patch the damage. This degrades membrane function further. 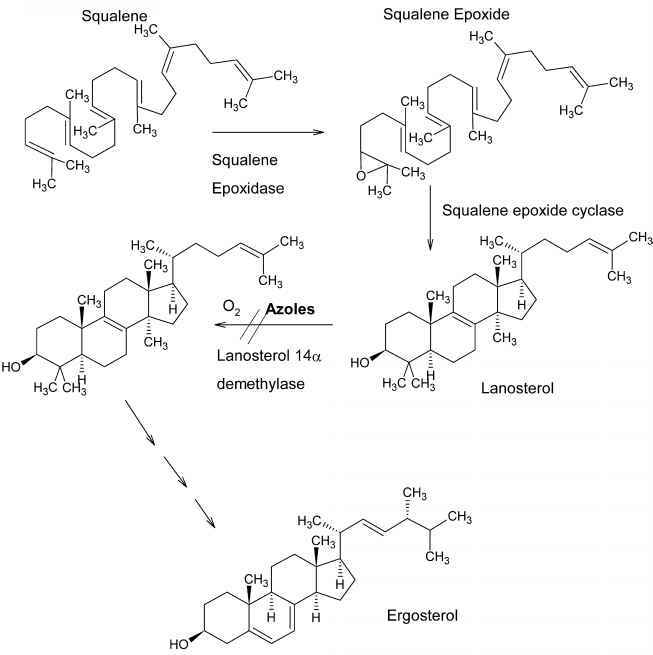 Lanosterol 14a-demethylase is also required for mammalian biosynthesis of cholesterol, and the azoles are known to inhibit cholesterol biosynthesis.47 In general, higher concentrations of the azoles are needed to inhibit the mammalian enzyme. 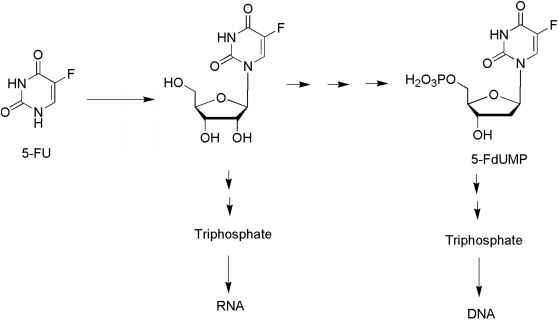 This provides selectivity for antifungal action. The 1,2,4-triazoles appear to cause a lower incidence of endocrine effects and hepatotoxicity than the corresponding imidazoles, possibly because of a lower affinity for the mammalian cytochrome P450 enzymes involved.48 The primary mode of resistance to the triazoles and imidazoles in c. albicans is the development of mutations in ERG 11, the gene coding for C14-a-sterol demethylase. These mutations appear to protect heme in the enzyme pocket from binding to azole but allow access of the natural substrate of the enzyme, lanosterol. Cross-resistance is conferred to all azoles. Increased azole efflux by the ATP-binding cassette (ABC-1, which normally transports cholesterol) and major facilitator superfamily transporters can add to fluconazole resistance in c. albicans and c. glabrata. Increased production of C14-a--sterol demethylase could be another cause of resistance.